The definition of sustainability has shifted over the last few years, to the point where "being sustainable" is as much about the occupant’s ability to survive their own built environment as anything. The workplace has undergone a design awakening over the past few decades, much of it driven by the quest for increased employee productivity, according to the U.S. Green Building Council. One of the latest iterations was that workers would thrive with more light, lower walls, fresh air, plants and informal gathering spaces. They do and will, but there is much more to the equation; be it the use of adhesives, finishes, material ingredients or increased air ventilation. Design is not static, and much continues to be learned through concepts like ethonomics — a synthesis of design, technology, science and humanistic principles set within the context of social, economic and environmental ethics. 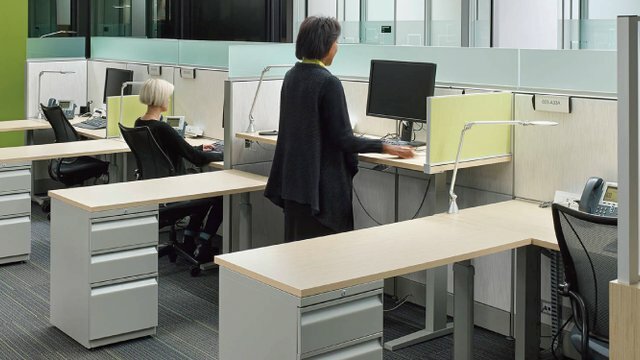 “If we promote physical and psychological health and well­-being among workers, we can begin to reduce medical costs, improve productivity and performance, net happier and more engaged workers and ultimately realize greater economic value,” says Tracy Backus, director of sustainable programs for Teknion. According to a recent productivity study of 32,000 workers by Jones Lang LaSalle (JLL), almost half admitted to performing below par and not being as engaged as they could be. JLL field studies show that a workplace environment that features natural light, thermal comfort and good indoor air quality can dramatically improve employee productivity. Some studies claim productivity gains of 20 percent and more from greening the workplace. But what if, by applying ethonomic principles, workers could gain an additional 10 percent production increase? What would that mean to the employer’s bottom line and head count? Clients like TD Bank and other market leaders such as CBRE are focused on workplace wellness. In 2013, CBRE became the first commercial office in the world to achieve WELL certification for a commercial office space through the WELL Building Standard pilot program. The workspace integrated key features to improve employee health and well­-being, both to drive inspiration and to enhance productivity and focus. These features focus on optimal indoor air quality, circadian lighting, active design, biophilia, drinking water and access to healthy food. TD Bank and its TD23 project in downtown Toronto’s TD Centre is going even further by using the WELL standard. Successful in achieving WELL gold certification, the 25,000-square-foot office renovation is already seeing the return on investment of healthier built environments – so much so that the company is bringing wellness to its retail branches in three locations across North America. TD Bank incorporates the WELL concept, a global workplace strategy initiative that features a balance of private and collaborative workspaces designed to support the way employees work through enhanced flexibility, mobility, technology, productivity and wellness. As part of its WELL certification, the TD Toronto office offers employees healthy and organic fruits and vegetables and numerous sit/stand desks and incorporates plants throughout the office design. An interconnecting staircase, along with murals and artwork along paths of travel, promote activity during the day. Studies are underway to determine the return on investment on the concept, according to the USGBC. The project is also registered under LEED ID+C: Commercial Interiors with the certification goal of LEED gold. TD’s office features include a water filtration system designed to eradicate impurities, ergonomically crafted furniture engineered to provide occupants with greater flexibility and movement, abundant daylight and lighting systems to support circadian rhythms, a tranquility lounge where employees can break from the open office plan and a wellness library. There is also messaging throughout the space to bring awareness to not only employees in the corporate office, but also in the retail offices for customers and those not specially aware of the health attributes possible in the built environment. Teknion is registered and pursuing the WELL Building Standard for its New York and Toronto offices. As the wellness ethos expands in the workplace and melds with the economic reality of employee productivity — ethonomics —increasing numbers of such projects are expected.